A bottle of Domaine Carneros Brut, a Lake Champlain chocolate bar, and a champagne stopper. Includes Banfi Chianti Classico Riserva surrounded by the highest quality Italian imports including aged Balsamic vinegar, Extra Virgin Olive Oil, premium pasta, Cerignola olives, and authentic Italian cookies. A bottle each of Chalk Hill Sonoma Chardonnay and Pinot Noir paired with Smoked Gruyere, Sopressata, a decorative cheese knife, Dalmatia fig spread, gourmet crackers, and rosemary breadsticks. 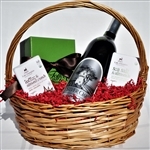 A bottle of Silver Oak Alexander Valley Cabernet, two selections of Lake Champlain chocolate bars, and a 1/2 box of Toffee to Go.